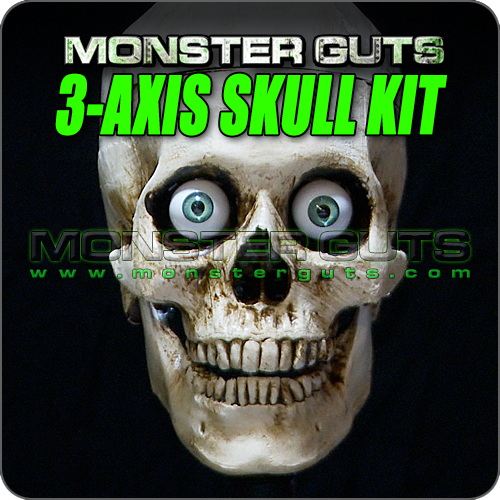 The long awaited Monster Guts: 3-Axis Skull Kit is FINALLY HERE! If you've ever wanted to build-your-own REALISTIC 3-Axis Skull at a very affordable price, then this kit is just what you're looking for! With over a year of development, using the highest quality internal parts, all the main pieces are precision CNC milled at Monster Guts Headquarters to ensure the highest standard! 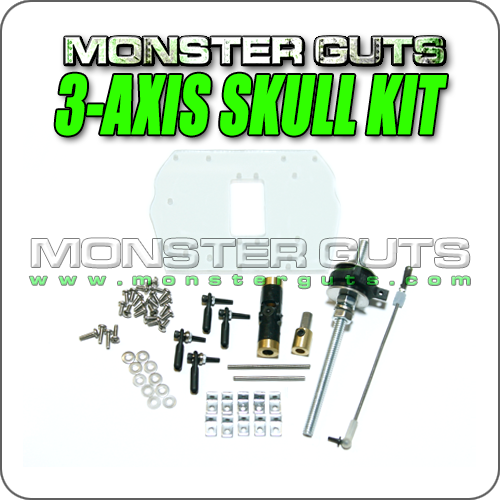 The Monster Guts: 3-Axis Skull Kits are not only best quality, but also have best movement in the industry! The Monster Guts: 3-Axis Skull Base Kit includes: Servo Mounting Plate, Gimbal Axis Assembly, Servo Mounting Hardware + Screws Needed, Ball-Bearing Swivel Servo Linkages, Jaw Linkage Swivel Assembly, and All Internal Mounting Hardware. In addition, the Monster Guts: 3-Axis Skull Kit already comes with all the mounting holes and setup to add the Monster Guts: 2-Axis Eye Kit if you choose to add REALISTIC moving eyes to your skull. With easy-to-follow and highly-detailed documentation, you can literally have the entire Monster Guts 3-Axis Skull Kit internals assembled in about 90 minutes. The documentation takes you through step by step each section of assembly process so you assemble the whole kit perfectly, the first time! The download link keys for the PDF documentation will automatically be emailed to you when your purchase of the Monster Guts 3-Axis Skull Kit ships, so you will have the opportunity to completely read through them before you receive your kit! If you don't receive them, please check your spam. We have created a 3-Axis Skulls Frequently Asked Questions (F.A.Q.) page to specifically answer questions in regards to our Monster Guts: 3-Axis Skull Kit product. Be sure to check the 3-Axis Skulls Frequently Asked Questions (F.A.Q.) 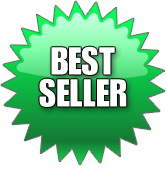 page BEFORE purchasing or sending an email to Monster Guts because we may have answered your question already and you can get your answer immediately. We highly recommend you using Hi-Tec Servos if at all possible. This kit was based around solid and rigorous testing using the "recommended" servos listed below. HiTec Servos use 24T (24 tooth) servo spline, while Futaba Servos use 25T (25 tooh) servo splines. If you wish to use Futaba Servos with the Monster Guts: 3-Axis Skull Kit, please email / contact us for more information before you order. *** If you WILL NOT BE USING the Monster Guts: 2-Axis Eye Kit in your 3-Axis Skull, you can use 1 - HiTec HS-425BB Servo or any other full-sized servo for the Jaw movement. *** The Monster Guts 3-Axis Skull Kit contains the BASE KIT / INTERNAL MECHANISMS ONLY as seen in the photo above, and DOES NOT INCLUDE Servos, Skull Model, 2-Axis Eye Kit, or any additional hardware / software to "control" the finished skull. The price listed above is for the BASE KIT / INTERNAL MECHANISMS ONLY. You can add Servos, Skull Model, and 2-Axis Eye Kit to your purchase by adding the additional options below. Monster Guts will NOT accept returns, refunds, or exchanges on the Monster Guts: 3-Axis Skull Kit product or packages. If you would like to add the Monster Guts: 2-Axis Eye Kit to your order, please first add the Monster Guts 3: Axis Skull Kit of your choice to your shopping cart, THEN proceed to the Monster Guts: 2-Axis Eye Kit product page to choose from the multiple options for that particular kit. All website contents ©2015 Monster Guts, LLC. All Rights Reserved.